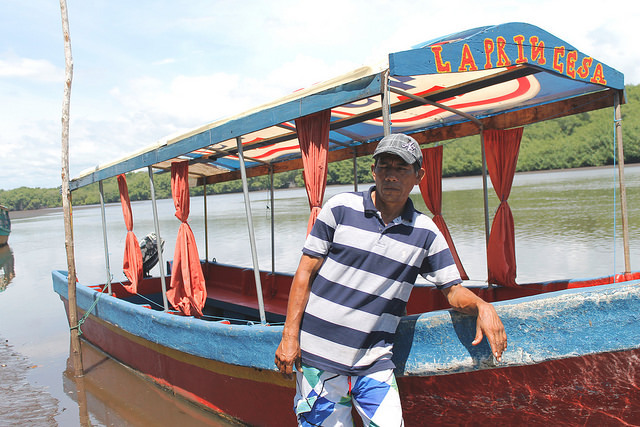 BARRA DE SANTIAGO, El Salvador , Nov 5 2014 (IPS) - Carlos Menjívar has been ferrying people in his boat for 20 years in this fishing village in western El Salvador surrounded by ocean, mangroves and wetlands, which is suffering the effects of environmental degradation. Siltation in the main channel leading to the town has hurt his income, because the buildup of sediment has reduced the depth and sometimes it is so shallow that it is unnavigable. Barra de Santiago, a town of 3,000 located 98 km west of San Salvador, can be reached by dirt road. 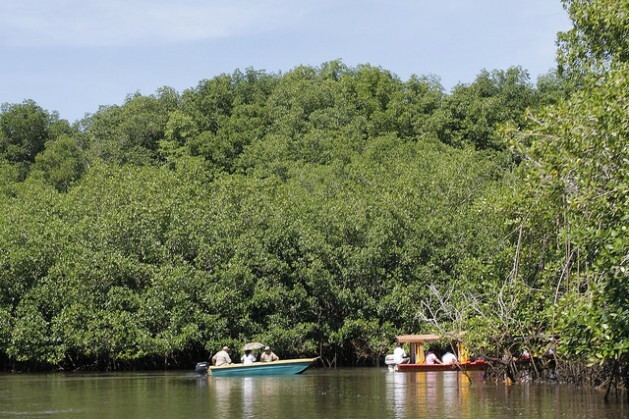 But some tourists prefer to get there by boat across the estuary, through the lush mangrove forest. Despite the natural beauty of the area, the mangroves run the risk of drying up along some stretches, because the siltation impedes the necessary irrigation with salt water. In the Barra de Santiago wetlands, which cover an area of 20 sq km, there are many species of animals, a large number of which are endangered, said José Antonio Villedas, the chief park ranger in the area. The economic effects also hurt the local residents of Barra, “because 99 percent of the men are dedicated to fishing,” he told Tierramérica, although ecological tourism involving the wetlands has been growing over the last two years. “The loss of depth in the estuary has affected fishing and shellfish harvesting, because we are losing the ecosystem,” said Villedas. The buildup of sediment in the estuary is one of the environmental problems facing this coastal region, which is linked to the degradation of the ecosystem occurring in the northern part of the department or province of Ahuachapán, where Barra de Santiago is located. Other factors are erosion and the expansion of unsustainable agriculture. Local organisations and the environment ministry launched a plan aimed at tackling the problem in an integral manner. The National Programme for the Restoration of Ecosystems and Landscapes (PREP) seeks to restore ecosystems like forests and wetlands and preserve biodiversity, as part of what its promoters describe as “an ambitious national effort to adapt to climate change,” whose impacts are increasingly severe in this small Central American nation of 6.2 million. One illustration of the changing climate was seen this year. In July, during the rainy season, El Salvador suffered a severe drought, which caused 70 million dollars in losses in agriculture, according to official estimates, mainly in the production of maize and beans, staples of the Salvadoran diet. But in October the problem was not too little, but too much, water. Moderate but steady rainfall caused flooding and landslides in several regions, which claimed three lives and displaced the people of a number of communities. PREP aims to address the problems by region. It is currently focusing on the Ahuachapán southern micro-region, an area of 592 sq km with a population of 98,000 people. The area covers four municipalities: San Francisco Menéndez, Guaymango, San Pedro Puxtla and Jujutla, where Barra de Santiago is found. The approach makes it possible to tackle environmental problems along the coast, while connecting them with what is happening in the north of Ahuachapán. Much of the pollution in the mangroves comes from the extensive use of agrochemicals on the maize and bean crops in the lower-lying areas and on the coffee plantations in the highlands. Inadequate use of the soil dedicated to agriculture produces erosion, which washes the chemicals down to the rivers, and thus to the sea. “Twelve rivers run into the Barra mangroves, and all of that pollution ends up down here with us,” said Villedas. But the local communities have not stood idly by. For several years now community organisations have been working in the area to raise awareness about the importance of preserving the environment, and are running conservation projects. Rosa Lobato, director of the Barra de Santiago Women’s Development Association (AMBAS), explained to Tierramérica that they are currently working with an environment ministry programme for the sustainable exploitation of mangroves for wood, which requires that for each tree cut down 200 mangrove seedlings must be planted. They are also working for the conservation of sea turtles and have set up five blue crab nurseries. “We are trying to raise awareness of the importance of not harming our natural surroundings,” the community organiser said. In July, Barra de Santiago became the seventh Ramsar Wetlands of International Importance site in El Salvador and the first coastal site. The designation commits the authorities to step up conservation of the area. These efforts are combined with measures taken in the nearby El Imposible National Park, one of the most important tropical forests in this Central American country. El Imposible, which covers 50 sq km, has the highest level of diversity of flora and fauna in El Salvador, according to the Salvanatura ecological foundation. It is home to 500 species of butterflies, 13 species of fish, 19 species of lizards, 244 species of snakes, 279 species of birds and 100 species of mammals, as well as 984 plant species and 400 tree species. In the middle- to high-lying areas in Ahuachapán small plots of farmland are being developed in pilot projects with a focus on environmentally friendly production, which does not involve the slash-and-burn technique, the traditional method used by small farmers to clear land for planting. In addition, crop stubble – the stems and leaves left over after the harvest – is being used to prevent soil erosion and keep sediment from being washed towards the coast. In the highlands, where coffee production is predominant, efforts are also being carried out to get farms to use the smallest possible quantity of agrochemicals and gradually phase them out completely. “It’s obvious that we can’t keep doing things the same old way…we can’t continue to carry the burden of this degradation of the environment and the impact that we are feeling from climate change,” Lina Pohl, the environment minister, told correspondents who accompanied her on a tour through the area, including Tierramérica. PREP will last three years and will receive two million dollars in financing from Germany’s agency for international cooperation. In the micro-region of the southern part of the department of Ahuachapán, which is part of the project, the plan is to restore some 280 sq km of forest and wetlands over the next three years, but the long-term goal is to cover 10,000 sq km.